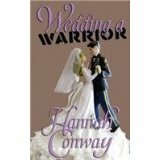 Although Wedding a Warrior by Hannah Conway is actually the prequel to The Wounded Warrior’s Wife, it’s the second of her books that I’ve read. I truly enjoyed this series and am hoping there’s third book! The relationship between Whitleigh and Collier is sweet and clean. It’s the tale of young love and the desire to follow God’s leading even if it means going in a different direction than planned. Although they love one another, they know they will never be satisfied either with each other, or apart, if they do not follow God’s calling for their lives. Collier has a warrior’s heart and he knows what he needs to do but he longs for Whitleigh to be by his side. Yet he loves her enough to let her go if that’s what is best for her. Whitleigh has lived a life of preplanned, calendar events and does not like anything that’s not in the plan. She’s finding that loving a warrior means she’s also going to have to gain a courageous spirit. What a great story to share the difficulties and adventures that military families endure. I loved it!